Casino Room and NetEnt will team up to offer the rockin' Guns 'n Roses video slot machine in just a few short days. Although music is a popular theme among online gamblers, finding a decent rock-themed slot has always been difficult. Although there are a few out there, some are quite generic in nature and very few actually feature a popular band. All of that is slated to change early this year when Casino Room makes NetEnt's Guns 'n Roses slot machine available to its patrons, and there are three exciting promotions from which to choose. Guns 'n Roses hit the stage back in the mid-1980s. Frontman Axl Rose, guitarist Slash, bassist Duff McKagan, and drummer Rob Gardner came together and took the world by storm. Hits like "Welcome to the Jungle" and "Paradise City" still resonate in the minds of those who grew up during the era. In fact, some claim that Guns 'n Roses takes them back to their carefree teenage years of living on the edge and rocking well into the morning hours. According to NetEnt, users will be able to actually choose their set list as they play. Classic like "Sweet Child 'O Mine" and "November Rain" are available, as is the band's lesser known title track to "Chinese Democracy", which was released in 2008. The game is visually stunning with the reels set against a background that looks like a massive outdoor stage. Icons include Axl himself, the bands iconic logo, and poker symbols 10 through Ace decorated in stunning red roses. Casino Room will host the Guns 'n Roses Leaderboard Event from January 21 through January 28, 2016. During this exciting week, players will be able to accrue one Guns 'n Roses point for every £25/€30/USD40/AUD50/CAD50/SEK300/NOK300 they spend on the game. Those with the most points have the chance to win some excellent prizes, too! Those who come in 4th to 20th places will receive 50 free spins on the GnR slot with a 45x wagering requirement on their winnings and 10 days to clear it. 3rd prize is a Samsung Smart LED TV worth about £550, 2nd prize is an iPhone 6S with a 5.5-inch display (or an Android equivalent) worth £619, and first place is a ski break worth £1500. 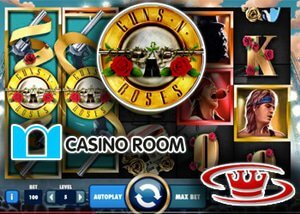 The first day that the Guns 'n Roses slot machine is launched at Casino Room, players can take their pick of several freeload and reload offers available to them. Players can input the following codes to take advantage of these offers. •	GNR100 - Deposit €10 and get 100 free spins •	GNR150 - Deposit €20 and get 150 free spins •	GNR200 - Deposit €50 and get 200 free spins •	GNRBFS - Deposit €100 or more and get a 100% match up to €100 and 200 free spins. Each free spins offer comes with a 45x wagering requirement which individuals will have 10 days to clear. The cash bonus offer with GNRBFS comes with a 35x wagering requirement, and individuals will have seven days to clear it. Finally, players can also receive an excellent reload offer between January 22 and January 25, 2016. Any individual who makes a deposit between these dates can receive a 100% match worth up to £200/€250/USD300/AUD400/CAD400/SEK2500/NOK2500! It comes with a 45x wagering requirement that must be cleared in seven days. To take advantage individuals only need to enter the code GNRRL at the time of their deposits. Casino Room is truly rolling out the red carpet for Guns 'n Roses and Net Entertainment, who have geared up to bring patrons one of the boldest, loudest, and best slot machines of the decade. The excitement is truly palpable, and Casino Room certainly adds more with these three big promos.